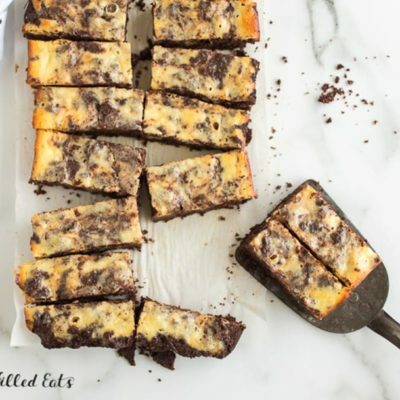 These Cheesecake Brownies are dense and fudgy with a beautiful swirl. They are quick to make and have only 6 ingredients! Quite the assortment right? 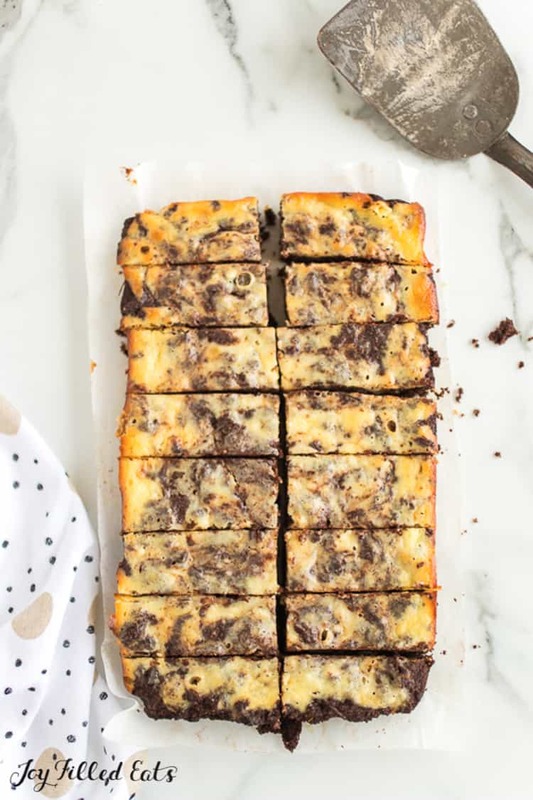 These Cheesecake Brownies were one of the first brownie recipes I ever posted and one of the best! But they were desperate for new photos and come better instructions so here they are at the top of the list again. 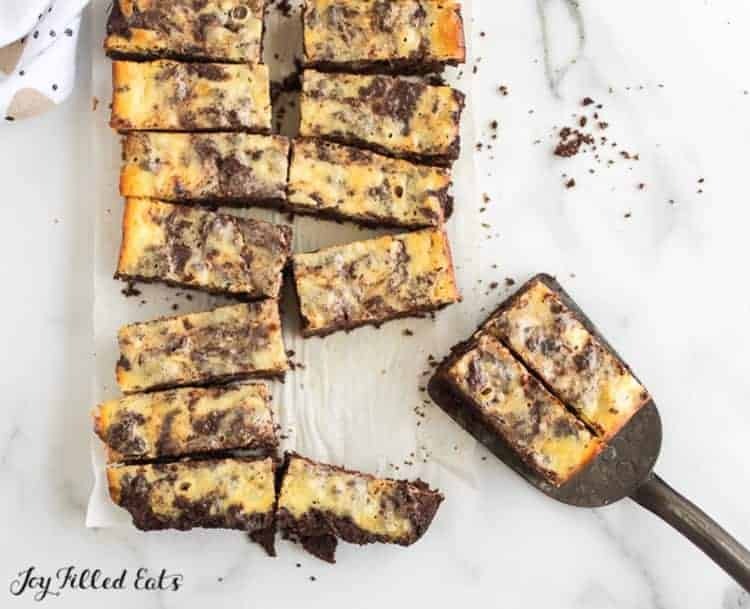 It is easy to make cheesecake brownies. Just make the brownie batter spread it in the pan, then make the cheesecake batter and swirl it in. Bake and you get the best of both worlds. Creamy cheesecake and fudgy brownies. Most of my brownies start with melted unsweetened chocolate. 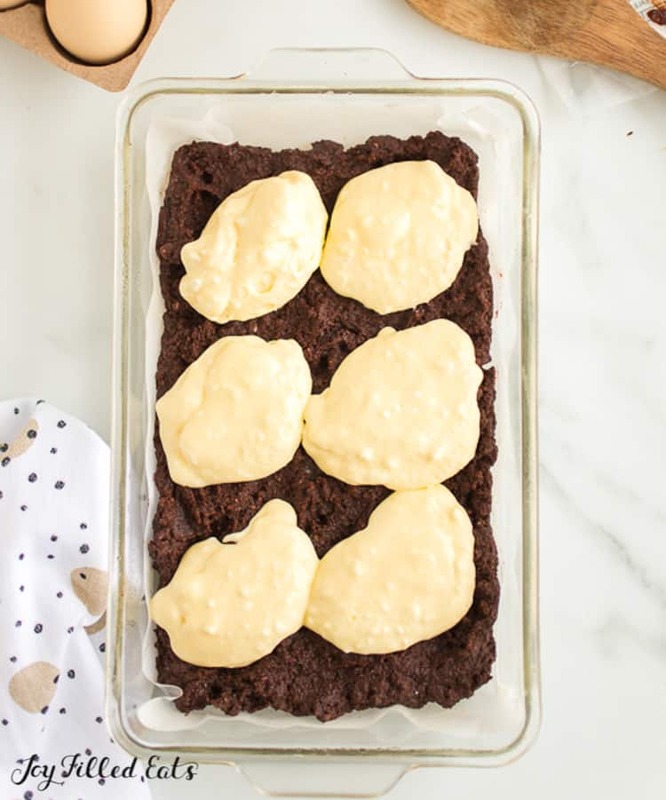 You can make brownies with cocoa powder (like these low carb brownies) but I’ve found that melted chocolate brownies are fudgier and I’m a fudgy brownie girl. Trim Healthy Mama Baking Blend – Baking blend is a low carb and low-calorie blend of Oat Fiber, Organic Coconut Flour, Golden Flax Meal, Blanched Almond Flour, Collagen Peptides, and Glucomannan. Almond Flour – I’ve really come to prefer almond flour in baked goods. It gives a tender crumb in cakes, cookies, and biscuits. Coconut Flour – Just a little bit of coconut flour goes a long way. Coconut flour helps to balance the oiliness of almond flour since it is naturally drier and absorbs more liquid than other alternative flours. Unsweetened Baking Chocolate – Unsweetened baking chocolate is naturally low carb because it is only chocolate. It has 3g of fiber for 4g of carbs leaving only 1 net carb per serving. 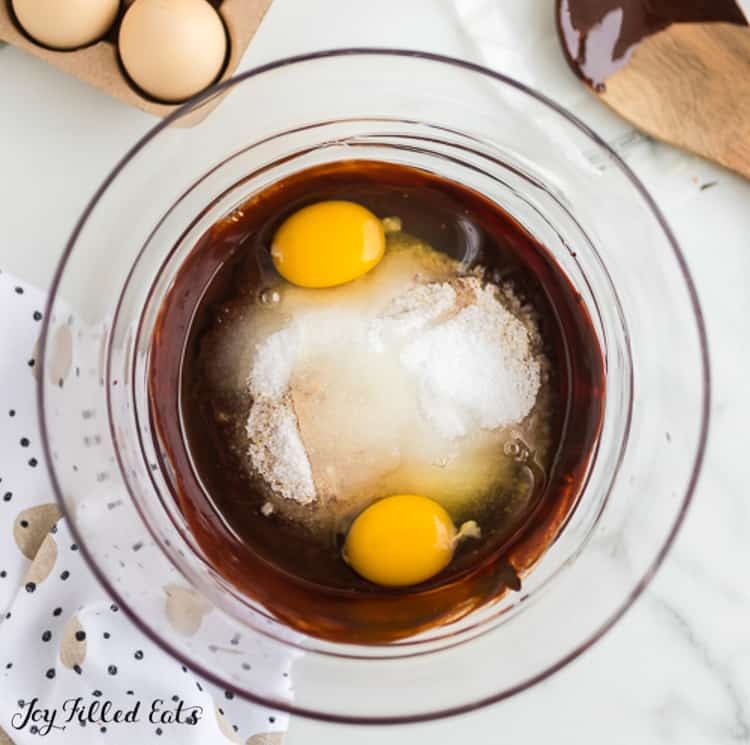 Sugar-Free Sweetener – I like to use a blend of xylitol, erythritol, and stevia in my recipes. You can purchase this pre-mixed from the Trim Healthy Mama website or mix your own according to my recipe. By using a combination of sugar alcohols and stevia you can use half the amount required of regular sugar. Since these sweeteners can be more expensive this helps with my food budget. And then you just need Butter, Eggs, and Cream Cheese! If you are using baking blend these have 6 ingredients. If you sub in almond and coconut flour they have just 7. Love cheesecake? I have a big variety of low carb cheesecake here too! 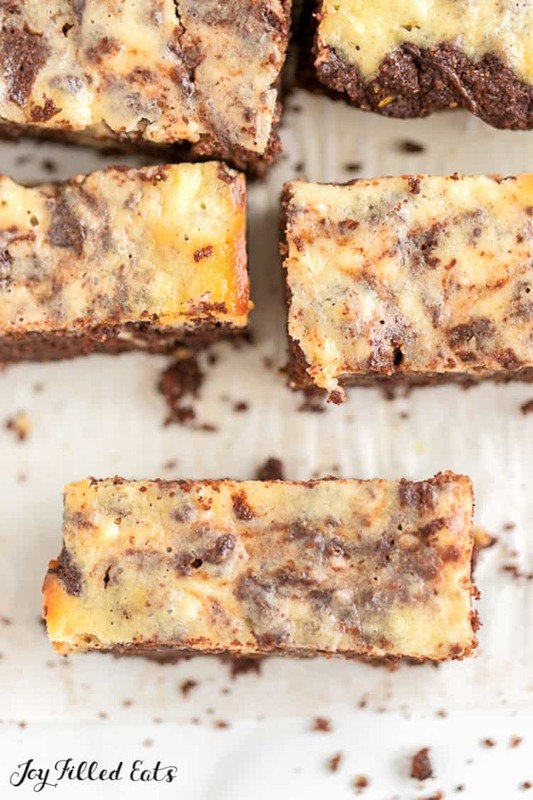 Want more cheesecake topping on your cheesecake brownies? Go ahead and double the part of the recipe! You may need to increase the cooking time by a couple minutes but its worth it for extra cheesecake. 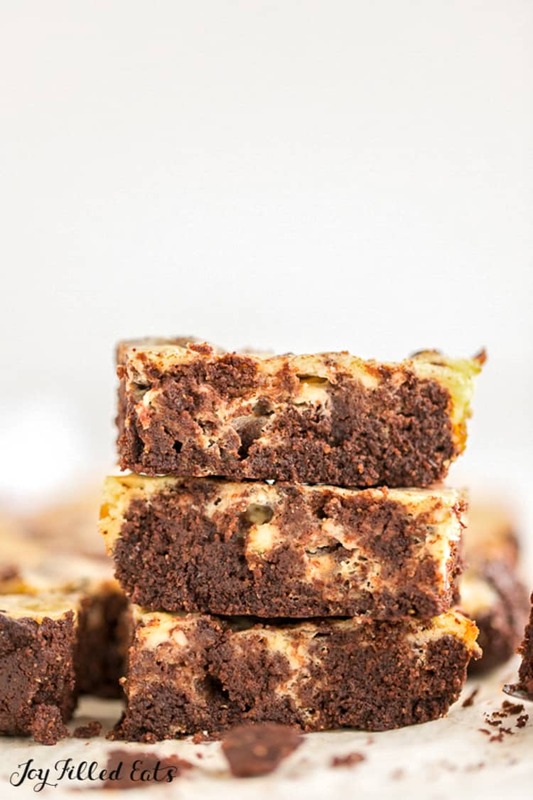 Cheesecake Brownies are rich and decadent with luscious brownies and a ribbon of cheesecake. Preheat oven to 350. Grease an 8x6 glass baking dish (you can use an 8x8 but the brownies will be a bit thinner than mine). Melt the chocolate in a microwave safe bowl (or on top of a double boiler). Add the butter and stir until that is melted. Add then add the baking mix, sweetener, and eggs and stir until completely incorporated. Spread in the baking dish. Set aside. 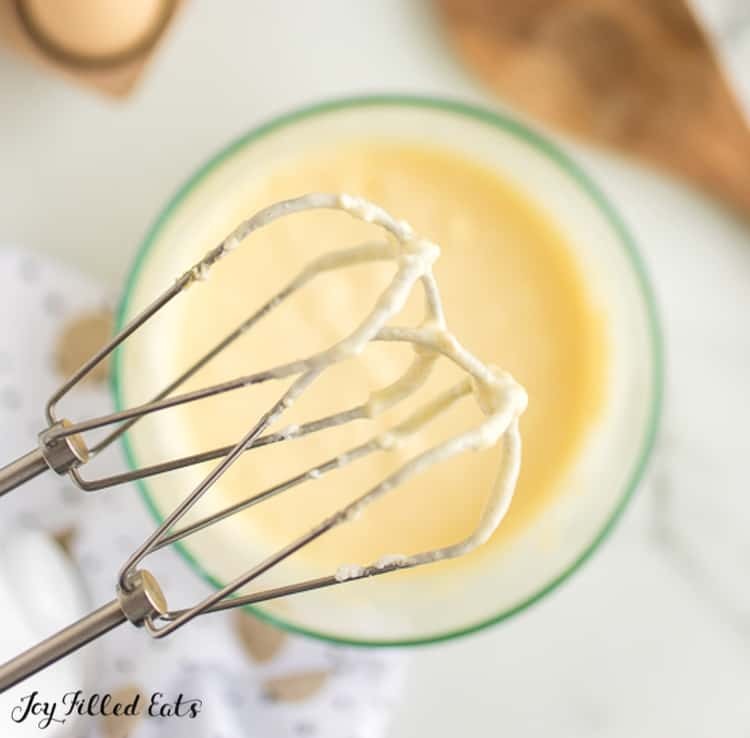 Make the cheesecake swirl by mixing the ingredients until smooth with a whisk or electric mixer. Drop spoonfuls on top of the brownies and swirl gently. Bake for 25-30 min or until the middle is set and the edges are golden brown. Originally Published March 29, 2016. Revised and Republished January 24, 2019. Delicious! Was NOT disappointed. Even my family love them! I love the idea of combining two desserts into one. These looks delicious! Looks delicious!! Cannot wait to try these.